The first few decades of the eighteenth century were highly fraught ones for Safavid Persia. 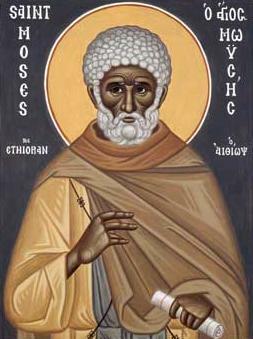 One of the handful of eyewitnesses to some of these events was one Catholicos Abraham of Crete, who found himself caught up in the Persian resurgence under Nādir Shāh Afshār. Nādir, of Turkoman background, had risen to prominence in the service of the presumptive Safavid heir Ṭahmāsp in the aftermath of the Afghan invasions earlier in the century. Nādir quickly proved himself an apt and ruthless commander- Abraham calls him a ‘second Alexander’- and soon deposed Ṭahmāsp, enthroned Ṭahmāsp’s son and set himself up as regent. He then resumed an already existing struggle against the Ottomans for control of what is now northwest Iran, Armenia, and Azerbaijan, which is where Abraham first encountered him. By Abraham’s account, Nādir was extremely courteous and respectful of the Armenian ecclesial leader and of Armenian interests generally (though not always); Abraham relates Nādir’s pious visit (using the Arabic loan zīyāret to describe the visit) to the holy Armenian see of Ējmiatsin. In the waning days of 1735 Nādir summoned the notables of his domain to assemble on the Mughan Steppe near the confluence of the Kura and Aras Rivers, a region that lies in the modern nation of Azerbaijan. In the course of this long encampment, during which the elderly Abraham was forced to cope with cramped living quarters, snow and rain, and distance from home, Nādir was ‘voluntarily’ acclaimed as Shāh by the assembled notables and military men. The following account takes place in the days before Nādir’s arrival at the assembly; it describes the fortifications set up to protect the camp, and the rather somber, but ecumenical, Epiphany/Christmas celebration (both the Nativity and the Baptism are celebrated) in the Armenian quarter of the camp. As is the case throughout Abraham’s chronicle, Arabic, Persian, and Turkish words and titles are used extensively, reflecting the degree of inter-cultural interaction in contemporary Armenian life generally. The presence of Armenian Muslims is also notable, though not particularly surprising in light of the many interactions seen elsewhere in the chronicle. The Baptism of Christ. 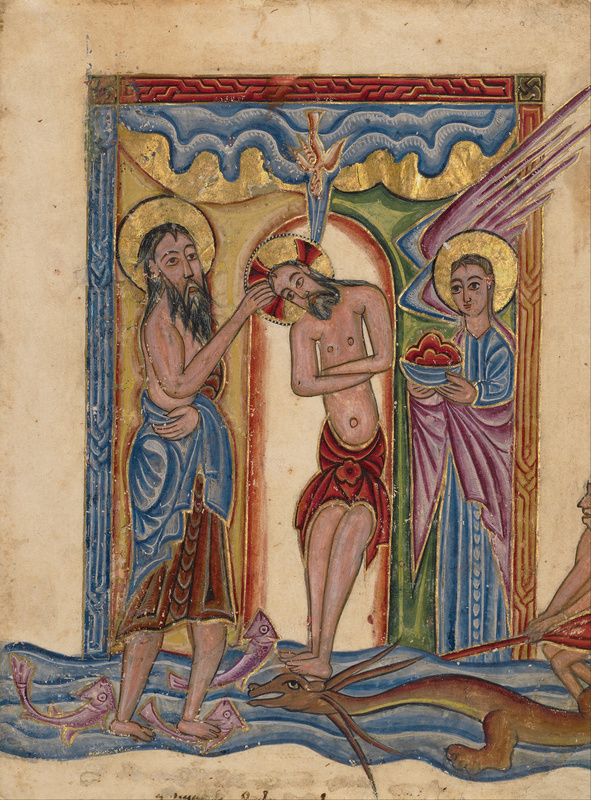 Leaf from Ms. Ludwig II 7: Mesrop of Khizan (Armenian, active 1605 – 1651). Isfahan, Persia, 1615. Tempera on glazed paper. After visiting all of this, we returned to our quarters, which were an hour’s distance from the confluence of the Arax and the Kura Rivers, for the bridge across the Arax was located within the area were the army was stationed, while the bridge across the Kura was below the camp and we were stationed in the upper part of the camp. Next day, on a Tuesday, we pitched a large tent, which we had brought from Holy Ējmiatsin and which resembled a church, having a cupola-like top and decorated with drawings, crosses and flowers. I ordered that all born to the faith of the Illuminator to gather there and those [Armenian soldiers] who were in the camp to come to my tent the next day [Christmas Day]. On Christmas Day they all came to my tent and we celebrated the feast of the birthday of Christ, Our Lord. We did so without an altar or liturgy, without any spiritual satisfaction, just like the ancient Israelites who hung their harps on willows. Thus with sad faces and broken hearts out people against my will dressed and taking the few church vessels and religious utensils we had brought with us, which were indispensable for a religious procession, I, together with priests, deacons, and lectors, dressed in robes, dressed in robes and carrying lit candles descended from the tent to the Arax. There we performed the ceremony of the preparation of holy water by pouring the holy meṛon in the waters of the Arax. The kalantar of Erevan, Melikjan, Melik Hakobjan, Melik Mkrtum, Melik Ēgēn of Dizak were present. At my command he removed the cross from the water. In addition [there were] the kadḳodās of Erevan and the Ararat province, the Armenians in the army, the āqā of Erevan, and distinguished people, such as the sheikh ul-Islam, the qāẓī, and the Khan’s yüz-başı; altogether more than 300 Armenians and Muslims. The amazing thing was that the Persians took the water mixed with the meṛon and anointed their faces with it. I then left them and they went to their own places. We returned to our tent. There were some distinguished people with us whom we had invited to dine with us. Patmut’iwn of Kat’oghikos Abraham Kretats’i, translated by George A. Bournoutian (Costa Mesa, California: Mazda Publishers, 1999), 57-59.